Below is a list of future concerts by Festival Brass; more details for each concert will be added when known. Saturday 1st June 2019 at7.30pm Riverside Theatre, Coleraine - Festival Brass with Ceara Grehan. 'A Musical Evening' - Festival Brass with Peter Corry, The Northern Ireland Concert Band and compere Wilfred Pyper MBE. 'Festive Brass and Voices' - Festival Brass with Father Martin O'Hagan, Cruinniú and compere Gerry Kelly. 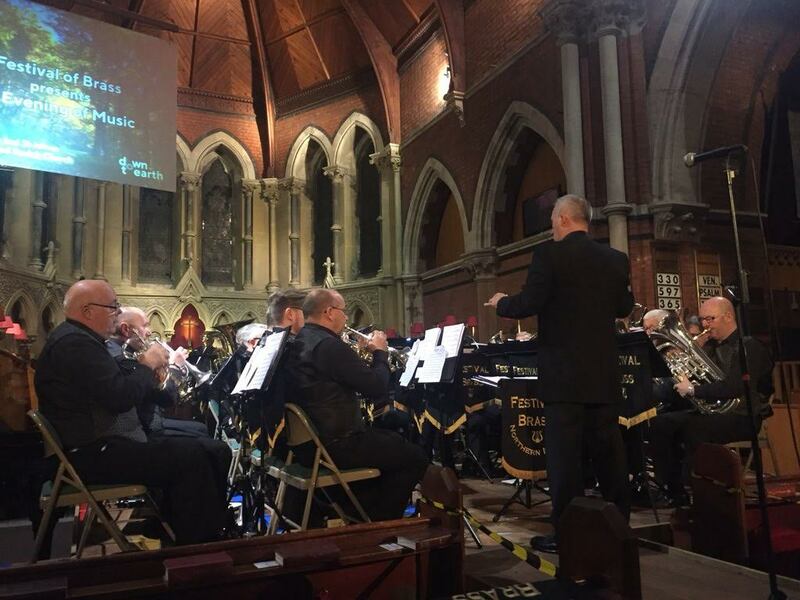 Festival Brass marked the centenary of the the Armistice that ended the First World War at a special Songs of Praise service in St Marks, Dundela, Belfast on Sunday 11th November 2018. Our guest soloist for the evening was Father Martin O'Hagan. 'An Evening of Music' which featured Festival Brass, guest soloist Ceara Grehan and compere Wilfred Pyper. The proceeds from this concert go to benefit projects in Kkalwe, Uganda, Asha in Delhi, India as well as church funds. Silver & Gold - Festival Brass were invited to be the guests of the Arklow Shipping Silver band to participate in their 50th Anniversary concert. Providing all the music for the second half of the concert we were joined by the guest soloist Naoimh Penston and Crinniú. At the end of the concert we were joined by members of the Arklow band to play the Floral Dance under the direction of Derek Broadbent, whose arrangment of the Floral Dand took the Brighouse and Rastrick brass band to number two in the UK singles chart at Christmas 1977. Project 325 The Finale, Festival Brass with guest soloist Nik Parks and compere Denise Watson, in Lisburn First Presbyterian Church. 15th Annual Concert by The Clare Chorale, with compere Gene Fitzpatrick, in the Theatre at The Mill, Mossley Mill. The Clare Chorale are a mixed voice choir from Ballyclare. Their conductor is mezzo-soprano Sheelagh Greer and their accompanist is Darren Day. Festival Brass with Ceara Grehan, Crinniú and compere Noel Thompson. Friday 17th November 2017, at 1st Presbytarian, Donaghadee. Baubles and Brass - a musical evening among the trees. Friday 20st October 2017, at Glenmachan Church of God. Festival Brass with Peter Corry, PSNI Ladies Choir, PSNI Male Voice Choir and compere Wilfred Pyper. Friday 21st April 2017, at Saintfield 2nd Presbyterian Church Hall. Festival Brass were honoured to be the guest performers as the Linday Chorale held their annual concert in celebration of the 21st Anniversary of the chorales formation. The choir continue to flourish under the musical direction of John Dallas and accompanist Sheelagh Greer, and have attracted several new members recently. Saturday 15th October 2016, at Glenmachan Church of God, Belfast 'Stage and Screen'. Festival Brass, along with soloists Ceara Grehan and Aaron Kavanagh, Little Flower Girls Schools choir and compere Wilie Pyper, celebrated the music of stage and screen. Band items included favourites from the small screen like 'Hawaii 5 O' and the big screen like 'The Magnificent 7'. Tenor horn soloist Fraser Ramsey gave us a sublime rendition of 'Over the Rainbow' from 'The Wizard of Oz'. Whilst the trombone section of Steven Cairns, Stuart Adair and Dessie Trousedale performed 'I Will Follow Him' from 'Sister Act' without a habit or wimple in sight. This concert was held in St Bernadette's Parish Church, Rosetta Road, Belfast on Friday 20th May 2016 and featured Festival Brass, the church choir, folk choir and soloists. This concert was held in Willowfield Parish Church, Belfast on Saturday 6th February 2016 and featured Festival Brass, the Sing for Live choir and Mairead Healey as the guest soloist. Just over £3000 was raised for Cancer Focus on the evening. This concert took place in Gilnahirk Presbyterian church, Belfast on Saturday 5th March 2016 with soloist Ceara Grehan and compere Alan Beattie; organised by the Presbyterian Church Women's Guild, the proceeds of this concert were to benefit various charities and church funds. To celebrate our 20th annivesary Festival Brass held a concert on Saturday 24th October 2015 in Glenmachan Church of God. 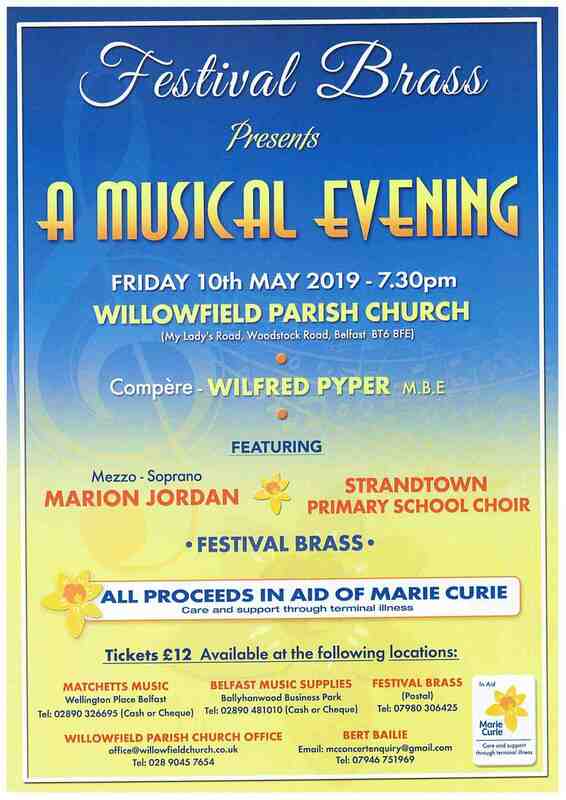 Starring Peter Corry with the choirs of St. Joseph's Primary School, Ballyhackamore and Penrhyn Preparatory School, Strathearn, and compere Wilfred Pyper, the event was a spectacular evening of music making. Among the songs Peter performed, he was accompanied by Festival Brass in Cole Porter's 'Miss Otis Regrets', Neil Diamond's 'Love on the Rock', Randy Newman's 'That'll Do', Paul Anka's 'My Way' and Phil Coulter's 'Remember Me'. Penryhn performed 'Food, Glorious Food' and 'Be Back Soon' from 'Oliver', 'Plese tell Me', 'No More Songs to Sing' and 'Close Every Door to Me' from 'Joseph'. St. Joseph's performed 'Naughty' from Matilda, 'Sing', 'Hold Back the River' by James Bay and 'Happy' by Pharrell Williams. Peter was joined by both choirs to perform 'Any Dream Will Do' from 'Joseph'. Festival Brass started the concert with 'Fanfare and Flourishes' and the march 'Steadily Onwards'. Band soloists were David Corry performing 'Georgia On My Mind' on cornet and Alan Hunter performing 'I Know Why' on flugel horn. The cornet trio 'Trumpters Wild' was performed by David Corry, Mark Evans and Ian McIlrath. The band also played 'My Comfort and Strength' (a meditation on the 23rd Psalm), the march 'Hoch Heidecksburg' and the wartime medley 'Keep Smiling Through'. The band's finale piece was a real tour-de-force performance of Tchaikovsky's 'Finale from the Fourth Symphony'. Festival Brass would like to thank everybody who contributed to a successful celebration of our 20th anniversary, but especially Glenmachan Church of God and Geoff Clarke and his team for sound, lighting and audio-visuals. On Saturday 6th June 2015 Festival Brass performed in Belmont Presbyterian church, Belfast with Ceara Grehan, east Belfast singer Eddie Spence, the choir of Penryhyn school, also based in east Belfast, and compere Wilfie Piper. The main aim of the concert was to raise funds for 'The Friends of the Cancer Centre' (Belfast City Hospital) and Target Ovarian Cancer, as well as raise awareness of ovarian cancer. The concert was a great success with many of the audience using words like "fabulous" to describe the evening. A total of £4120 was raised and all the money was split between both charities. Every woman attending the concert was also given a leaflet, produced by Target Ovarian Cancer, describing the symptoms of ovarian cancer. Ovarian cancer is still frequently diagnosed at an advanced stage as the symptoms are not widely known and can often be mistaken for other conditions. 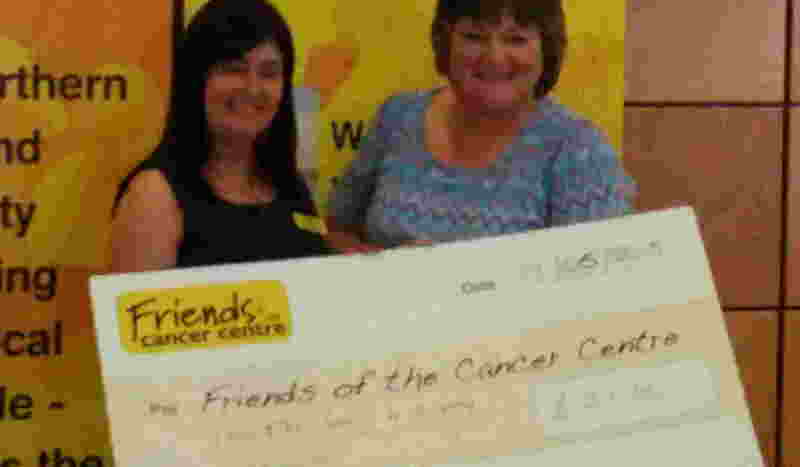 The Friends of the Cancer Centre is a local charity based in the centre at Belfast City Hospital. They raise funds to provide clinical care, patient comfort and care, and research. Their website can be visited by clicking here. Target Ovarian Cancer is the national ovarian cancer charity, based in London, working to save lives and help women diagnosed live their lives to the full, wherever they are in the UK. They provide information leaflets about the symptoms of ovarian cancer and booklets for woman who have been diagnosed and living with the disease. They also lobby parliments and regional governments, including the NI Assembly, around the UK to raise awareness of issues assoicated with ovarian cancer. Target Ovarian also funds research into the disease. Their website can be visited by click here. Pictured is the concert organiser, Ann Adair, presenting a cheque for £2060 to a representative of The Friends of the Cancer Centre. This concert was held in the parish church of St Batholomew's on the Stranmillis Road, Belfast to benefit the work of the church in it's local community. The audience were treated to a superb evening of brass and voices with Festival Brass, Ceara Grehan, Karl McGuckin, accompanist Wilson Shields and compere Wilfred Pyper. With the band Ceara performed 'Don't Be Cross' and 'Don't Cry For Me Argentina', Karl performed 'Some Enchanted Evening' and 'Old Man River'. Ceara and Karl also performed with piano accompaniment by Wilson Shields, with the highlight being their fabulous duet of 'All I Ask of You' from 'The Phantom of the Opera'. Among the band items were soloists Nathan Thompson (Cornet) performing the 'Meeting of the Waters' and John Murdock (Euphonimum) with 'Drigo's Serenade'. As part of the Magdelena 2015 celebrations Festival Brass were invited to participate in the 27th International Band Festival alongside bands from Belgium, Holland, Hungary, Poland, Spain and the USA. As the only brass band we provided a contrasting musical style to all the other participating bands which were 'marching bands' and included drum majorettes, flag wavers etc. Among the events was a procession through the city of Castellon which was watched by crowds estimated to be in the 100,000s. All the bands also performed in the main square on Saturday night and Sunday morning in front of an audience of about 4000. To view photographs of our trip please visit our gallery page here. The concert for the Belfast Temple Summer School, which took place on Saturday 28th February 2015 starting at 7.45pm in Willowfield Parish Church, raised over £1900. 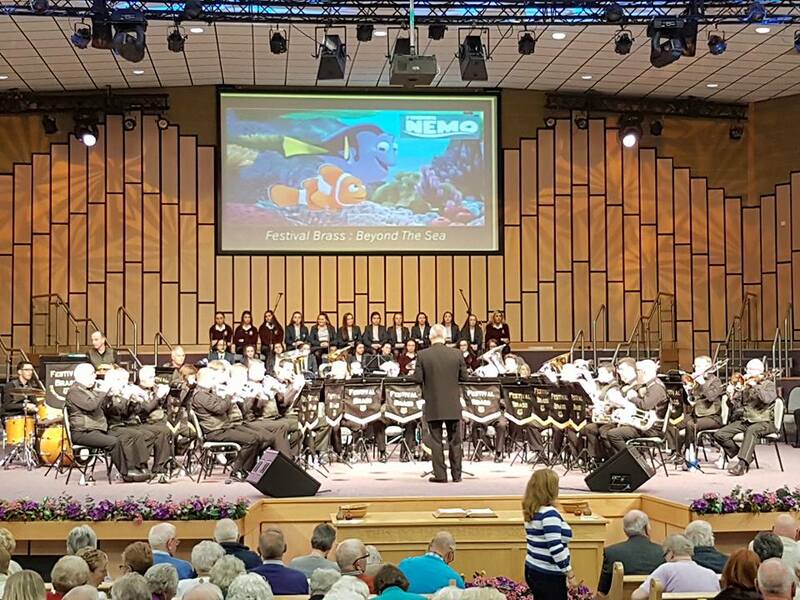 The Belfast Temple Summer School is an annual event where the young people of the Salvation Army get together for musical and spiritual tuition. Many brass players in Northern Ireland, including some members of Festival Brass, have benefited from attending previous Summer Schools. Our guests for the concert were Kathleen McGookin and the Singing Company (the childrens choir from the Belfast Temple). Kathleen had previously sang at many Salvation Army events but came out of 'retirement' to give a fabulous performance of songs including a selection from 'My Fair Lady' and Greig's 'The Last Spring'. The Singing Company were a hit with our audience with their selection of more modern praise songs, including an arrangement of the well known childrens hymn 'Jesus Loves Me' called 'When My Energy's High'. The latest of our annual Festive Brass and Voices concert, which has become a highlight of the Christmas season for many, was probably one of the best and most spectacular in recent years. This was in no small part to the participation of our guest artitistes Peter Corry, Fiona Flynn, Nick Parks and Nuala Mannion. Along with Festival Brass and piano accompaniment our guests performed songs such as 'Nella Fantasia', 'All I Ask of You', 'Go the Distance', 'Cradle in Bethleham', 'Nessun Dorma', 'Ave Maria', 'The Prayer', 'Who is He' and many others that were enthusiasticly received by our audience. Band items included Nathan Thompson playing the cornet solo 'O Little Town of Bethlehem', Gary Dodsworth playing the baritone solo 'Donegal Bay' and brothers David and John Corry playing the Eb soprano cornet/Bb cornet duet 'The Cleansing Stream'. Our compere for the evening was as usual the incomparable Mr. Wilfie Pyper. This whistlestop celebration of European music was held on Saturday 8th November 2014 in the comfort of the Glenmachan Church of God; no passports or baggage allowance required! This was a free concert by Festival Brass with donations reqested to aid the Boy's New Haven Orphanage in India and the Sonshine Club Project in Kenya; two charities supported by the Glenmachan Church of God. With compere Wilfie Pyper, solists Ceara Grehan and Mairead Healey, this concert was a jam packed extravaganza of all things musically European, from marches 'Holyrood and 'Wien Bleibt Wien' to Abba's ' Mama Mia,' stopping on the way with the 'Habenera' from 'Carmen', 'Tulips from Amsterdam', 'The Happy Wanderer', 'Finlandia' and many more in between. Our one unscheduled stop was a suprise guest appearance by Peter Corry singing 'Anthem' from 'Chess' to celebrate Alan and Peter's parents 60th wedding anniversay. Ceara and Mairead performed with the band, but also accompanied on the piano by Chelsea Pasco. The girls performance of the 'Flower Duet' from Delibes' 'Lakme' was one of the highlights of the evening. Band solists included David Corry playing the virtuosic Cornet solo 'Concert Etude' and John Murdock playing the lyrical Euphonium solo 'Drigo's Serenade'. Festival Brass with Donaghadee Male Voice Choir and soloists Siobhan Petit and James Huish, compere George Jones. Queen's Hall, Newtownards on Saturday 25th October 2014. The first concert after the summer was held to benefit Holywood Music Festival on Saturday 4th October in Belmont Presbyterian Church, Belfast. With compere Wifie Pyper our special guests were Mairead Heney and the choir of Strathearn Prep school. Band soloists were Alan Hunter playing the cornet solo 'Sunshine of Your Smile'', Robin Clinton on Flugel Horn in the 'Concerto de Aranjuez' and John Murdock playing the Euphonium solo 'Drigo's Serenade'. Mairead performed 'I Don't Know How to Love HIm', 'Nella Fantasia' and 'Time to Say Goodbye' with the band, and a few more accompanied on the piano by Chelsea Pasco. The stars of the show were the 54 girls of the Strathearn Prep School (Penryhn) who delighted the whole audience with their performance. Friday 30th May 2014 -St. Brigid's Church of Ireland, Glengormley, Belfast - featuring Mairead Healey. Band soloists were Sam Brodison playing the cornet solo 'My Love is Like a Red, Red Rose', Robin Clinton on Flugel Horn in the 'Concerto de Aranjuez' and Stephen Cairns playing the Trombone solo 'Everytime I Say Goodbye'. Mairead performed some songs accompanied by the band and a few more accompanied on the piano by Chelsea Pasco. Saturday 10th May 2014 - Assembly Buildings- Fisherwick Place, Belfast - featuring Peter Corry and accompanist Steven Barnett- Ballyclare Male Choir conducted by Paul Briggs and accompanied by Sheelagh Greer. Band soloists were David Corry playing the cornet solo 'Spanish Eyes' and Stephen Cairns playing the Trombone solo 'Everytime I Say Goodbye'. All performers combined in 'An American Triology' for the finale item. Saturday 14th December in Glenmachan Church of God, Belfast with the New Lyric Operatic Company. Lights!! Camera!! Action!! the second helping of Music from Stage and Screen took place on Saturday 26th October 2013 at 7.30pm in Glenmachan Church of God, Belfast (website) with compere Wilfred Pyper, and guest solists Ceara Grehan, Mairead Healy and Karl McGuckin. Saturday 28th September 2013 at 7.30pm in Bangor Salvation Army, Bangor with guest solist Julia Clarke. Saturday 25th May 2013 - joint concert with Harmonie De La Cite youth band from Montreal, Sydz Kidz Choir of The Salvation Army and compere Wilfred Pyper at Glenmachan Church of God, Belfast (website). On Saturday 6th April 2013 Festival Brass was joined by Peter Corry and accompanist Steve Barnett before a full audience in the wonderful setting of Willowfield Parish church. This concert was organised by David Corry who, as well as being principal cornet with Festival Brass, is the bandmaster of the Salvation Army band in Sydenham. Despite the wet weather the concert on Saturday 9th March was before a full audience. Our guest soloist for the evening was the talented soprano Mairead Healy. On a wet and windy Friday 25th January 2013we joined forces with Donaghadee Male Voice Choir to commemorate the sixtieth anniversary of the sinking of the MV Princess Victoria which went down 5 miles off the Copeland Islands with the loss of 133 lives. The concert was held in a large marquee erected close to Donaghadee harbour; the wall of the marquee behind the stage was a window that looked out to the former Donaghadee lifeboat, the Sir Samuel Kelly, which rescued 44 survivors from the Princess Victoria. Our annual christmas 'Festive Brass and Voices' concert took place on Saturday 22nd December at Glenmachan Church of God. We were pleased to have the New Lyric Operatic Company (website) as our guest choir under the direction of Michelle Hart and accompanist Loretto McAuley. The compere for the evening was our old friend Wilfie Pyper. For the second year running the band was invited by the Kings Chorale to be the guest artiste at their annual Christmas concert. Our first Thank You concert proved to be a great success with approximately 400 old and new friends attending. Compered by the ever witty Wifie Pyper, we welcomed back Nuala Mannion as our guest artiste. In the beautiful venue of Clonard Monastry, Festival Brass were the sole act for the second half of that evenings concert. The band played for The Newtownabbey Music and More group on Tuesday 11th September 2012. Our guest singer for the evening was Nuala Manion, she was accompanied by Andrew Thompson, but also performed two songs with the band. On Sunday 19th August 2012 Festival Brass boarded the Norwegian Epic in Barcelona for the start of a one week cruise around the western Mediterranean Sea with stops at Naples, Civitavecchia (Rome), Livorno (Florence/Pisa), Cannes and Marseille. Organised by US based Travel Concepts this tour included Peter Corry, Alex Sharpe, members of the Ulster Operatic Company, the Peter Corry band and Festival Brass. Some of the performances by the group were private events but there were also open events for all passengers and crew. The band's open concerts were in the Headliners club, the stage by the Waves pool and the quayside at Marseille. As well as band items the band also accompanied Peter, Alex and Nuala Manion. To see photographs from the trip please visit our Gallery page here. The band concluded 2011 with two Christmas concerts, the first at Fisherwick Presbyterian church as guests of the Kings Chorale, and our own annual concert at Glenmachan. At the start of 2012 the band had the honour to play at the wedding of one of our tuba players, Laura Farling, in The Ulster Temple on the Ravenhill Road, Belfast and afterwards at Ballygally Castle. On 2nd March the band performed at Killinchy Presbyterian church with 'leading lady' Lynne McAllister; proceeds were to benefit the church African project. On Saturday 21st April the band returned to Glenmachan for the first 'Music of Stage and Screen' with guest artistes Peter Corry, Alex Sharpe, Kieran Griffiths, and compered by Wilfie Pyper. Featuring film, theatre and TV music this was an extremely succesful concert that we hope to repeat next year, watch this page for the sequel. Thursday 10th May saw the band play at a completely new venue, the Titanic Belfast centre, possibly the first brass band to perform there. The band's final concert before the summer was meant to be our performance at Glenburn Methodist church on Saturday 19th May until our performance at The Queen's Diamond Jubilee event on 27th June.